David Sullivan has lived a lifetime of lifetimes. His journey has taken so many twists and turns. Just when he thought he was going into a life of Hollywood excitement he was called to be a pastor. Thirty years later the door opened for him to re-connect with Hollywood as a film and TV producer. At the same time, doors began to open in such places as China, North Korea and Cambodia. Often called a networker? David prefers to view his life as full of very deep connections. His life's ambition has been to promote his Lord and Saviour any way that he can. From having coffee with one of the world's leading business people in Beijing or talking to a shoe shine boy in Shanghai, David shares the miracles of what God has been doing in his life and ministry, such as the way God opened doors for David in North Korea where he is involved with bakeries which now feed 25,000 children a day. Known throughout the world for his interviews with people in business, media, TV, film, entertainment and fashion, David's Christian guests have included Dr David Yonggi Cho (Founder of the world's largest church), Dr Young Hoon Lee (Dr Cho's successor), Joyce Meyer and Dr Luis Palau. David's prayers and hopes are that in this book of his life's story people will be encouraged in the same way that hundreds have been when he has shared with them one-to-one. 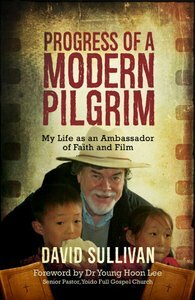 About "Progress of a Modern Pilgrim: My Life as An Ambassador of Faith and Film"